Although it's already the end of the first week of August and Fall is fast approaching it's surely not too late to share some summer outfit inspiration with you! Although my closet does have some designer pieces in it, I do try to buy inexpensive items to incorporate into the seasons outfits. At the same time I have learnt the hard way that scoring a good deal also pertains to whether it lasts the entire season or falls apart and pimples after 3-4 washes! Almost every accessory in this specific look was purchased from Forever 21- I always find so many great pieces there! 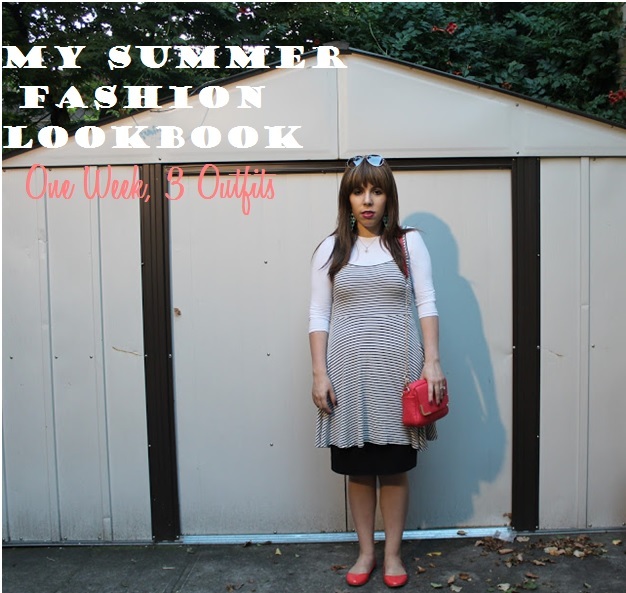 This weeks Youtube video is fashion related and includes a little look-book of sorts with 3 of my favorite summer outfits. This is one of them and I'd have to say it's my most worn of them as well so I just couldn't help sharing it! If you want to see those other outfits, go and have a look here or read till the end of the post where it will be inserted as usual. I wouldn't call myself a fashionista because that I am not, but I do love to get dressed up and play around with outfit combinations. Three years ago I was working a clothing store and to be honest I knew absolutely nothing about fashion or shopping and proper ensambles. I'd have to say that reading fashion blogs has really led to the whole discovery of the fun fashionable world out there. I've since become fashion obsessed- funny right? You may notice how bitten up my legs got just taking these photos, had I known the entire location was pretty much infested with mosquitos I probably wouldn't have worn any perfume and most likely would have been prepared with some bug spray. That is what summer is all about for me. I'll be itching and scratching a little for the next week or so but I'll be ok I'm sure. What I'm wearing: Shirt- Double Header Kiki Riki Cotton 3/4 Sleeve White Shell, Dress- Black & White Striped Dress with Lace Detailing in the back (thrifted, similar here) Skirt- Double Header Black Cotton Pencil Skirt, Sunglasses- Forever 21 Brown & White Aviators(similar here), Earrings- Forever 21 Blue Ombre' Triangle Long Earrings (similar here), Star Necklace (Gift from my Bubby Green for my 12th Birthday- I miss her so much and it's comforting to wear it), Shoes: Forever 21 Coral Patent Ballet Flat Shoes, Bag- Coral Metal Trim Crossbody Bag (Similar here) on My Lips- Smashbox Heat Wave Lipgloss: Fuchsia Flash, on My Nails: Sally Hansen Magnetic Nail Color- Purple. Really hope you've enjoyed seeing a bit of what my personal style is like! Let me know which of these pieces is your favorite or how you would style it, I would love to hear from you in the comments form!